Don’t wait until something happens. It will be too late. Do backups, folks! My backup strategy has evolved quite a bit over time. It still isn’t completely satisfying and probably never will be, simply because you can’t prepare for everything. What I could and should do is save part of my stuff on optical media, as they live longer than magnetic drives, and use an online storage service like Blackblaze or Crashplan (but I have trust issues, even if I don’t have any sensitive data, just private stuff). At first, I had no backup. Some time around 2001–2002 I started to back up my photos on CDs, then DVDs, then on an external drive. 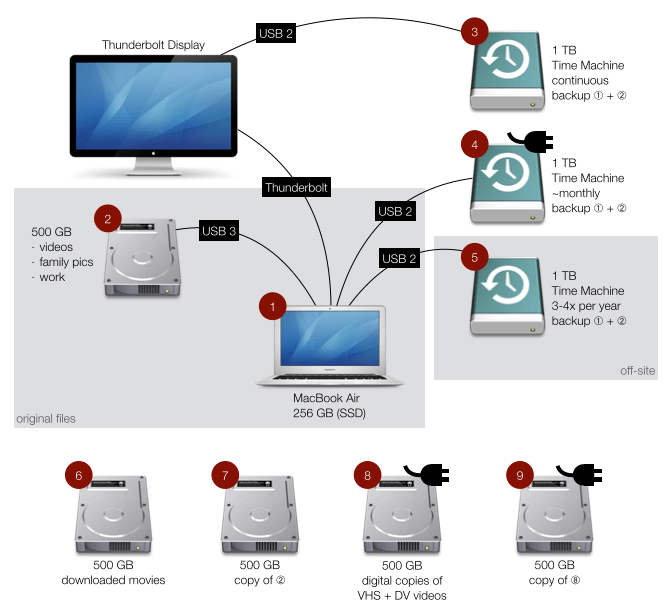 I never backed up my whole system until Mac OS X shipped with Time Machine. Thanks to Time Machine, I lost absolutely no data when my MacBook Pro got stolen in 2008. I bought a new Mac and imported everything seemlessly. I thankfully never had any harddrive failure nor any kind of incident except that one. Which doesn’t mean however that my backup strategy hasn’t evolved since. I now have the original files and three copies. Two copies are local, meaning at my appartment, and one copy is off-site at my Mom’s. All drives are encrypted, hence password-protected1. The cool thing, and I’m not bragging here, is that the backup plan I came up with, had been “validated” by other people2. Well, except for my lack of a cloud component, like I said before. For Mac users, the icons3 should be pretty self-explanatory. For the others, the silvery-grey boxes are harddrives and the blue-greenish boxes are Time Machine harddrives. 1 is my Mac. When I’m at home, it is always connected through Thunderbolt to my display. 3 is an external drive that is always connected to my display, and therefore makes continuous backups of my system4. Once a month (Time Machine reminds you, so you don’t even have to do that! ), I plug 4 into my Mac to back up Mac OS X 1. If 2 happens to be connected, 4 backs it up too. 6 has basically become useless, as it is almost as easy to download a movie right when you need it. 7 is a manual copy of 2. This could actually be improved. Drives 4, 8 and 9 need a power supply. Drives 6, 8 and 9 are not encrypted. It looks complicated, but it really doesn’t require any effort whatsoever. 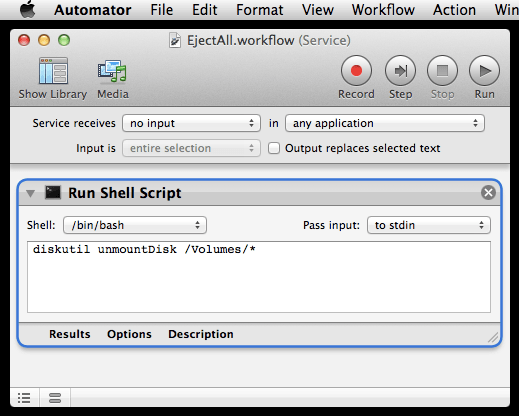 Because Mac OS X likes to complain when you eject a drive “improperly”, and because I’m too lazy to drag’n’drop it onto the trashcan (or right-click it to eject), I found a way to use a keyboard shortcut to eject 3 when I power off my Thunderbolt Display. 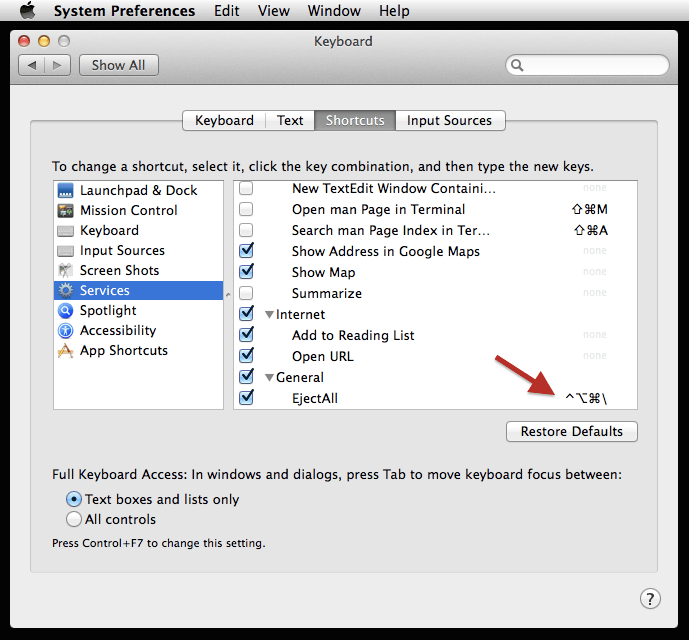 You create a service in Automator and you trigger it via a shortcut defined in the System Preferences.